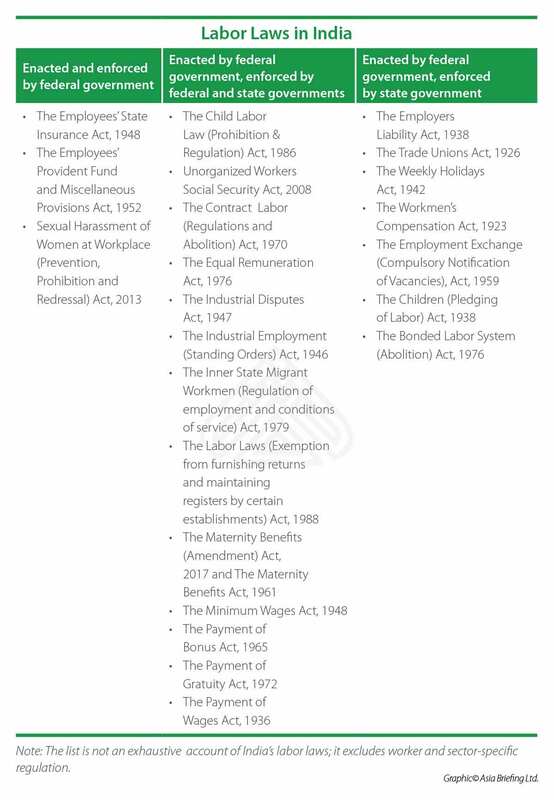 Labor regulations are derived from multiple sources in India. 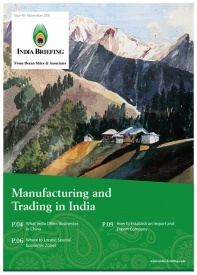 This concurrent nature of labor and employment laws can be confusing for companies that are newly established or looking to expand in India. Employers need to consider multiple factors when assessing their statutory requirements, such as their industry, location, and number of employees. While the government is often ineffective in enforcing its labor laws, the legal and reputational risks of non-compliance merit attention. Further, failure to observe best practices in labor matters by foreign entities can be politicized. 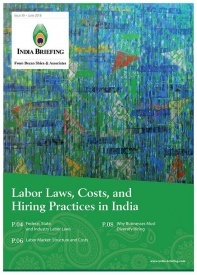 There are two broad categories of labor law in India. Individual labor laws deal with the employee’s rights at work, like the Rights of Persons with Disabilities Act, 2016, while collective labor laws govern the tripartite relationship between employers, employees, and labor unions, such as the Industrial Employment (Standing Orders) Act, 1946. 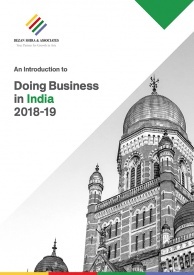 India has over 52 federal labor laws and 200 state enacted laws and amendments, creating a complex structure of legislation and compliances in the country. Federal legislation act as umbrella laws for state-level implementation. For example, the minimum wage requirement in the state-enacted Shops and Establishments Acts must be in line with the Minimum Wage Act, enacted at the federal level. State governments also enact certain laws, which enumerate compliances for companies established in those states. Key state law is the Shops and Establishments Act, which applies to all commercial establishments – any premise where business, trade, or profession is carried out for profit – and shops, where any business or trade occurs or services rendered to consumers. All terms and conditions of the employee-employer relationship in shops or commercial establishments are governed by this Act. It reiterates federal laws with regard to establishment registration, wages, as well as working scope and conditions, thus consolidating a majority of applicable federal labor compliances. Certain federal laws, such as the Industrial Employment (Standing Orders) Act, 1946, affect all industrial establishments where 50 or more workmen are employed and in establishments where the Shops and Establishments Act is applicable. The Act governs various aspects of employment, addressing the rights and liabilities of employees and employers and other conditions of service. Notably, state governments may amend this Act to better suit industry in its state. Companies operating in multiple states should be careful of the distinction between respective state labor laws and state-specific amended federal laws, even if the differences are minor. 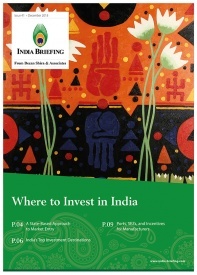 The IT and manufacturing sectors employ the majority of India’s formal workforce. Employers in these sectors, for example, need to fully understand legislation applied to their industry and their employees at large. IT companies fall under the ambit of state-legislated Shops and Commercial Establishments Acts. 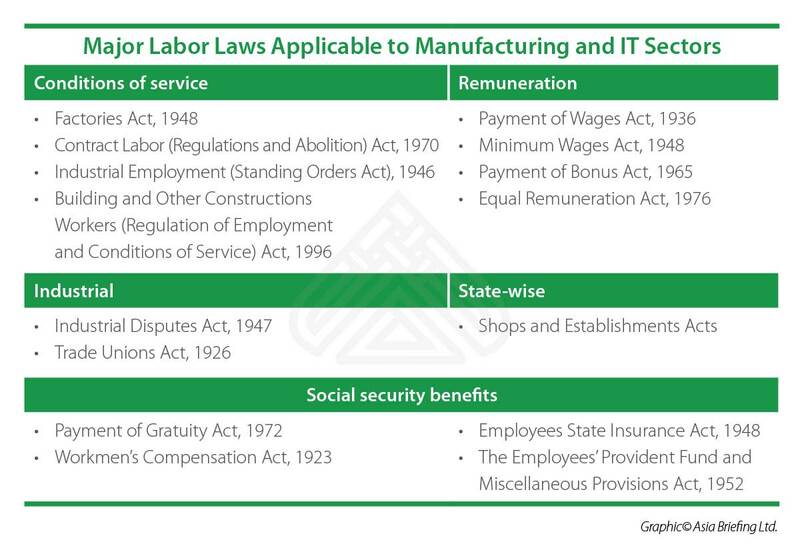 Firms should be aware that labor laws differ not only state-wise but may have industry-specific variations as well. For example, to improve ease of doing business for IT companies in Karnataka, the state government has revised provisions in the Shops and Establishments Act, such as employability of women or hours of work, while entirely exempting them from the federal Industrial Employment Act. Similarly, for the manufacturing sector, stringent clauses in the federal Industrial Disputes Act, 1947, mandate government permission to retrench, layoff, or even reassign any workers in an establishment with more than 100 workers. The states of Haryana, Maharashtra, Madhya Pradesh, Rajasthan, and Uttarakhand have raised the threshold to 300 workers under this law. The government has introduced a ‘Shram Suvidha’ initiative – a one-stop online portal. When an employer registers on to the portal, they are issued a labor identification number (LIN) that is used to access complaints and inspection reports, reducing the need to interface with government officials. The portal allows a simplified single online annual return form to be furnished for nine different labor laws, instead of filing separate returns under each of these labor acts. The payment of employee provident fund contributions and state insurance fund can also be done through this portal. India’s federal government also notified the Ease of Compliance to Maintain Registers under various Labor Laws Rules, 2017 (the “EOC Rules”). The EOC Rules consolidates 56 different registers into five. However, organizations need not maintain any register if less than 19 employees are engaged as per the Labor Laws (Exemption from Furnishing Returns and Maintaining Registers by Certain Establishments) Act, 1988.